Details Smalt is a fine to coarsely ground potassium cobalt glass of blue color. The blue is due to small amounts of cobalt added as cobalt oxide during manufacture. Many colors can be made from cobalt, but smalt was the only pigment to be made from it before the element was isolated in the 18th century. Smalt was an important pigment in European oil painting, particularly in the sixteenth and seventeenth centuries. Its origins probably lie in the blue pigment used by the ancient Egyptians, known as us as "Egyptian blue"; both pigments are made from glass that has been colored blue and both are also used as glazes on ceramics. Cobalt ore was heated to form an oxide, which was mixed with silica, and under the name saffre or zaffre, was then sold to glass-makers who fused it with potash to form smalt. Numerous early recipes for the preparation of smalt are known; they all mention mixing saffre, silica and potash, placing the mixture in a glass furnace where thy were left for twelve hours with stirring at intervals. The vitrified mass was later plunged into water to make it friable, so that it could be ground, sieved and washed. It was marked according to color grade, the best being a deep violet-blue and the cheapest a pale sky-blue. Being a glass, smalt is transparent. The particles of smalt are vitreous, meaning that they have highly reflective surfaces. As particles of smalt are ground finer, the surfaces are broken and fractured increasing its light scattering effect and lowering its color saturation. For this reason, smalt cannot be ground as finely as many other pigments, so it must be used rather coarse in paint. Due to its low refractive index, the color of smalt is more opaque when used in water-borne mediums and lime (fresco). In oil media a dull color may be obtained because the refractive index of smalt is close to that of dried oil. Smalt is known to fade in paintings, but the degree to which this occurs varies even within the same painting. The reason for the fading has only been understood quite recently. Some assumed that the fading resulted from leaching out of the cobalt. However, Professor Jaap J. Boon and his collaborators recently found that the potassium concentration is crucial to fading. 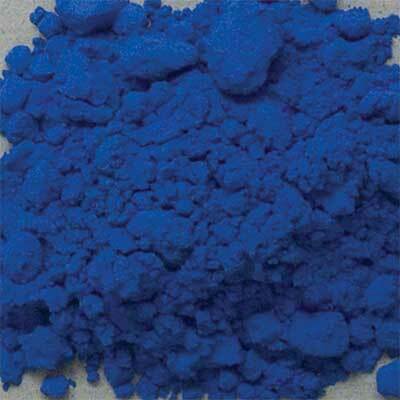 Where the ratio of potassium to cobalt is 1:1 or higher, the color has not faded. Potassium is strongly alkaline and their findings suggest that a certain level of alkalinity is required to maintain smalt's blue color. Drying oil creates a slightly acidic environment. The small proportion of fatty acids present in the oil may react with the potassium. Moisture must be present for this reaction to take place, but potassium is known to attract moisture and there will be occasions when the amount of moisture in the air is likely to be high. The conclusion is that smalt made with a higher proportion of potassium to cobalt will not fade. 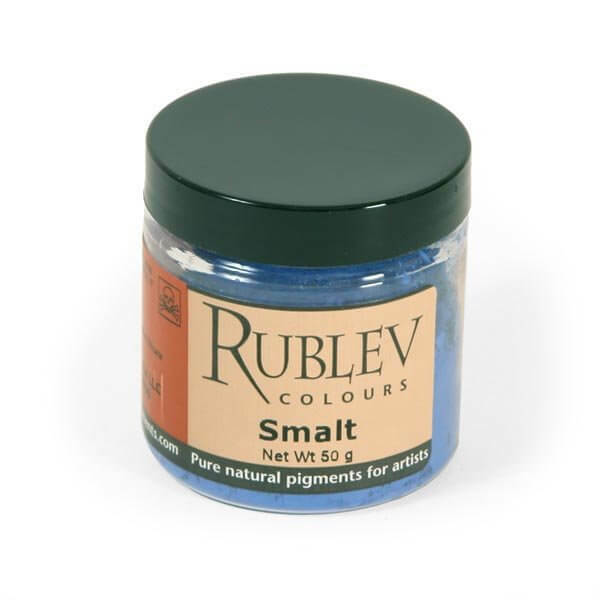 Rublev Smalt and Royal Smalt has a ratio of potassium to cobalt of 2.09 : 1.00. To further protect against discoloration, protect it and enhance its color it is best mixed with lead white. To prevent discoloration, tradition was to sprinkle the smalt over a fresh paint layer and then dusting off the superfluous pigment. Smalt exerts a powerful siccative effect on oils and was sometimes used for this purpose alone. Smalt absorbs a moderate amount of oil (25 g oil per 100 g of pigment). The pigment is refractory and difficult to wet, making the task of mixing the pigment with oil into a smooth paste difficult. It is best to add a small amount of bleached beeswax or aluminum stearate to the oil before mixing it with smalt. Allowing the oil and pigment mixture to "sweat" or stand overnight before further grinding with a muller often helps. Smalt contains cobalt, which can be toxic if inhaled or ingested. Care should be used in handling the dry powder pigment to avoid inhaling the dust.